The print trade had already made the work of contemporary British artists familiar across Europe. 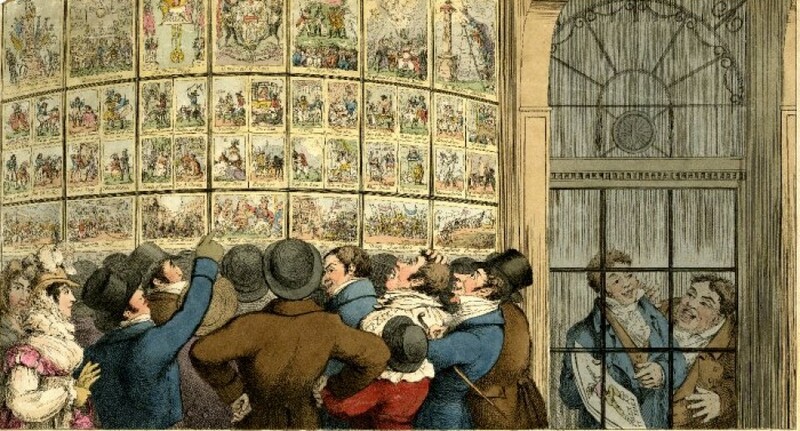 Continental collectors devoured the products of the London publishers, and artists across Europe were inspired by British satires. This exhibition includes work by James Gillray, Thomas Rowlandson, Richard Newton and George Cruikshank, some of the most thoughtful and inventive artists of their day. 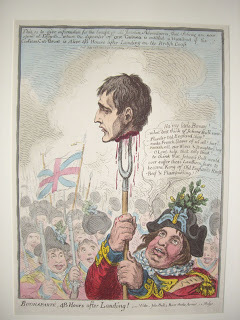 The range and depth of the British Museum’s collection allows the satirical printmakers’ approach to be compared with that of portraitists and others who tended to represent a more sober view of Napoleon. The exhibition begins with portraits of the handsome young general from the mid-1790s and ends with a cast of his death mask and other memorabilia acquired by British admirers. Along the way, the prints will examine key moments in the British response to Napoleon – exultation at Nelson’s triumph in the Battle of the Nile in 1798, celebration of the Peace of Amiens in 1802, fear of invasion in 1803, the death of Nelson at the Battle of Trafalgar in 1805, and Napoleon’s triumph at Austerlitz, delight at his military defeats from 1812 onwards, culminating in his exile to Elba in 1814. 1815 sees triumphalism after Waterloo and final exile to St Helena, but some prints reflect an ambiguous view of the fallen emperor and doubts about the restoration of the French king Louis XVIII. This exhibition also coincides with an exhibition of James Gillray’s work which will go on display at the Ashmolean Museum in Oxford from 26th March 2015.